Scooper - Entertainment News: Can you find the Ace of Spades in this card puzzle? Can you find the Ace of Spades in this card puzzle? The internet has been struggling to DEAL with the latest card-based puzzler to sweep the web. In this clash of cards, is one that’s unique from all the rest – the fearsome Ace of Spades. Can you work out where it is? The brain-teaser was produced by online casino Casumo.com, whose spokesman Greg Tatton-Brown said: “We’ve come up with a few puzzles in the past that we thought were difficult, but this ups the ante. “You’ll have to be a real ace to find the ace that we’ve hidden – anything under 60 seconds is fairly impressive." 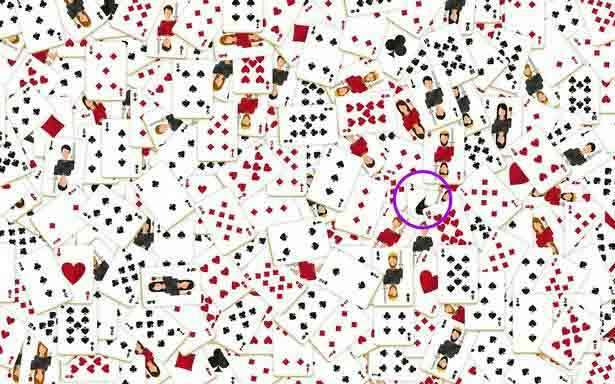 The puzzle was created by Casumo after they found that the average Brit is BORED for over nine years of their life. Brits describe themselves as “bored” for over three hours a day, and say that on average, they feel like they have “nothing to do” at least twice daily. Being stuck in traffic emerged as the most boring thing about modern life, aggravating over half of the nation. This was closely followed by waiting in queues at the post office, being put on hold, and the humdrum routine of everyday life. Greg Tatton Brown said: “At Casumo we’re always trying to eradicate boredom – and our quirky blog featuring another tricky puzzle is a great way to do just that.